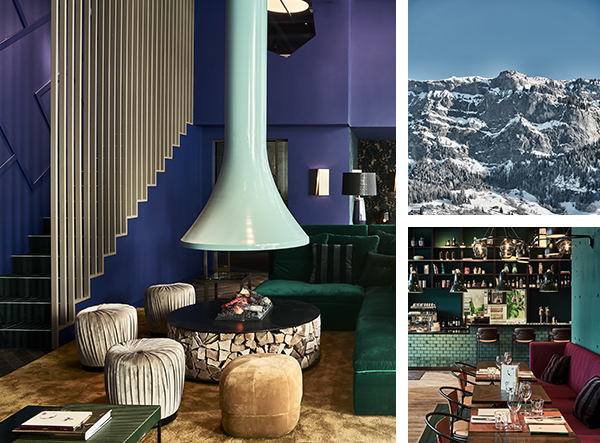 With immediate and direct access to 224 km of ski slopes, four snow parks and 28 ski lifts, The Hide Hotel Flims removes the need for car transportation, while the easy ski-in/ski-out approach places guests in even closer proximity to the area’s pristine pistes, with an extended slope allowing guests end their descent right at the hotel’s door. Designed by Baumschlager Eberle and cutting a sleek silhouette in the tony Swiss town of Flims, the four-story complex challenges local architectural norms while also paying homage to its environment; its elongated, elevated structure slotting into the landscape with ease while simultaneously imitating the rocky nature of this mountainous region. It all sets a striking scene for the 47 top-floor guestrooms and suites, each dressed by Erik Nissen Johansen of Stylt Trampoli in a striking compilation of oscillating wallpaper, jewel-toned velvets, geometric wall paneling, and floor-to-ceiling black mosaic tiled bathrooms, all finished with brass accents and low hanging lighting. 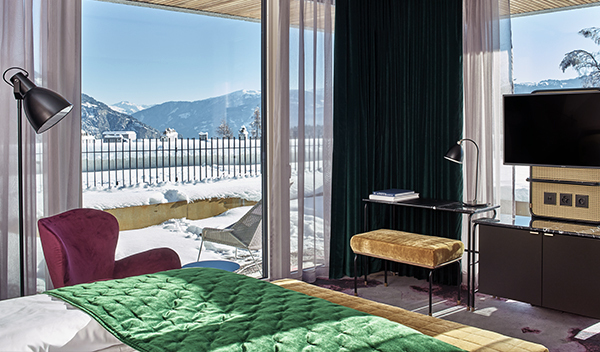 Each accommodation is crowned by an outdoor terrace that serves as a private observation deck from which to take in this UNESCO World Heritage certified corner of the Swiss Alps, with breath-taking views of the valley and mountains beyond. Public spaces equally toe the line between snug and sophisticated. Raw ceilings with exposed piping and striking pillars converge with bold deep pile carpets, plush curtains and intimate corners that invite endless lounging and people watching. A soaring, double-height entrance lobby — replete with wall art by artist duo Bane&Pest, tchotchke-filled shelving units and a suspended fireplace — is a dazzling space in which to idle, while the first-floor restaurant, Hide Dining, is where modern incarnations of specialties from the Grison region crafted by famed Swiss chef Adrian Tschanz are served alongside seasonal and international cuisine. The piece de resistance of the 84-seat space is a large glass dry-aging counter in which local beef is hung onsite, while brass grills, red banquette seating and modern chandelier lighting compound the venue’s status as The Hide’s fine dining outlet. At the more casual Hide Deli — also led by Tschanz — modern Middle Eastern flavors, Alpine classics and freshly baked bread are served day and night among green metro tiles and butter soft leather-backed chairs for a cool après ski vibe. For first timers and aficionados alike, winter sports are made simple at The Hide, with a ski-rental outlet, ski lockers and a ski and snowboard school all located inside the multifaceted complex that houses the hotel. Beyond the ski season, 250 km of hiking trails nearby and an in-house bike shop are on hand to satiate adventure seekers, while a partnership between the hotel and a local game keeper offers guests the opportunity to explore the local nature and wildlife. It’s all tied together by an onsite mountain concierge available to facilitate any equipment rentals, activity planning, and to provide insight of the far-reaching area, which includes the ‘Swiss Grand Canyon’ and the spectacular Lake Caumasee, bordered by thick forests.